+++Legally record, convert and enjoy protected Music, Videos, Movies and DVDs anywhere+++++Audials Tunebite Platinum - At a Glance++Stream recorder music & movies, audio & video converter for PCs, smartphones, tablets, Apple, Internet video downloader, the best Internet TV, DVD recorder, playlist media player, CD/DVD recorder, media manager, cloud manager.++Stream Recorder for Music & Videos++There are predefined recording profiles for the major music and movie platforms to make high-quality stream recordings and automatically save the files individually. ++Universal Converter & Format Converter with 60 File Formats for all Media and Devices++ Format converter converts audio and video files for PCs, smartphones, tablets, netbooks, notebooks and game consoles into all major file formats and in high quality.++Audio Formats++ WMA, M4P/M4B, MP3, MP2, WMA, WMA Pro, OGG, AAC, OGG, MPEG-4 AAC, WAV, FLAC, AIFF, AC3, AU, BIK, 722, MPC, AUD, W64, EAC3, OMA, SOL, WV, PVF, VQF, XA, AEA, CAF++Video Formats++WMV, M4V, MP4(MPEG4), TS, MKV, MPEG, MPG, AVI, MOV, FLV, H.264, XVID, DIVX, 3ivx, DV, CDXL, DFA, MVE, MVI, PAF, PMP, RPL, ROQ, VMD, 4XM++Convert Audiobooks in all Formats++Audiobooks can be converted as individual chapters or as a single, large file in the right audio format for all devices.++Prepare DVDs for Tablets and Netbooks++Smartphones and tablets are unable to play DVDs. The shelf life of DVDs is limited even when stored properly. 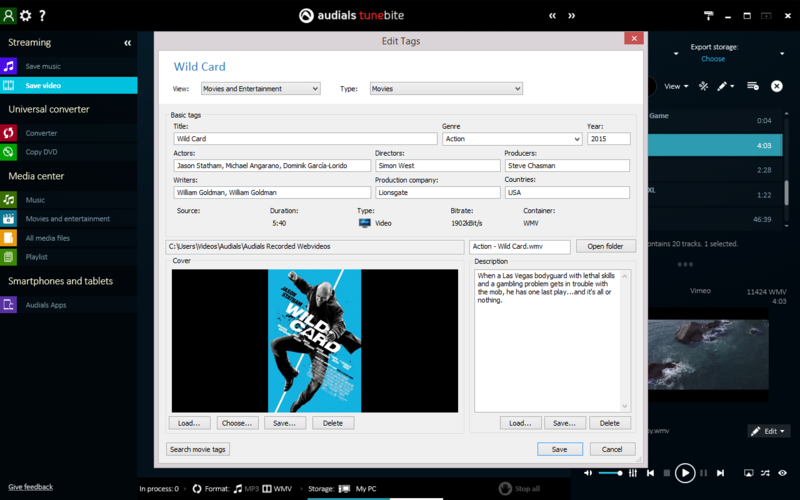 Tunebite re-records DVDs and saves them in any video file format.++Player, Media Manager, Tag Editor, Cloud Manager, DVD & CD Recorder included++ Player, recorder, media manager, cloud manager, ID3 tagger, audio editor. Improved Recorder for Audio Streaming of Music Services and Video Streaming of Video-on-demand Services, optimized recording method with pre-configured profiles available for major portals and services, new file formats for PC, smartphone, iPhone/iPAd, game consoles, improved Media Center.